My computer’s keyboard has decided that it doesn’t feel like typing the letter “h” anymore. Even though it just did in that last sentence, it’s a struggle lately to get the letter H typed down sometimes and it’s really annoying me! Does anyone else have this issue with their keyboard where it suddenly stops typing certain letters? Speaking of annoying, the ice maker in my freezer keeps making a “making ice” sound and I think I may lose my mind listening to it. 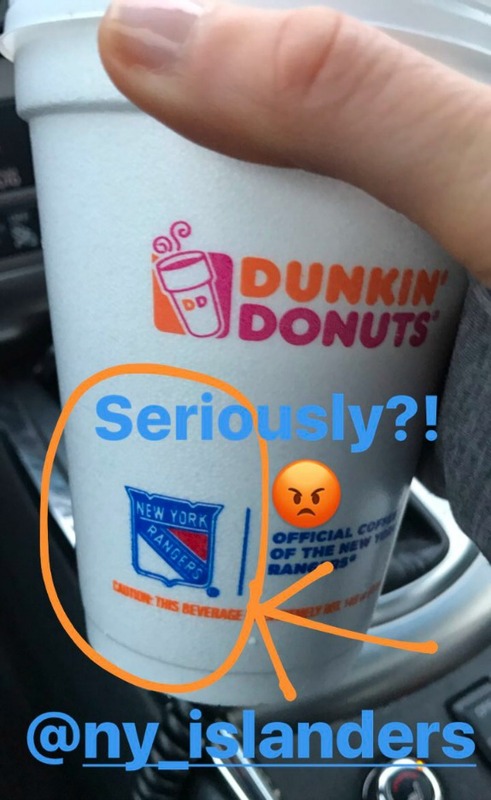 And if that’s not enough to annoy me, I stopped at Dunkin Donuts for coffee fairly early yesterday morning and was greeted with this obnoxious coffee cup after dealing with a drive thru window person not understanding what I was trying to order. I had to repeat myself about ten times (medium coffee with a drop of skim PLEASE) which was ten times too many for my personality. If I had to describe this week in one word, I guess you can figure it out from this post. Annoying. Everything and just about everyone has annoyed me more than the usual. It was bound to happen after being away last weekend I guess. Who wants to come back to real life after a quick fun trip? Not me. I will try to pretend that PMS isn’t about to kick in as well. Can you imagine the already annoyed mood combined with PMS mood? I know. I should come with a warning label for now. Anyone else in an annoyed mood this week? Feel free to complain! Do you struggle to get back to routine after a trip? Ive had an annoying week too. I had an issue with my work laptop a few years ago not wanting to type certain letters- I forget how it got resolved. I keep thinking how much I wish that today was Friday! such an annoying week! glad today is Friday. oh man. getting into routine after a trip is so hard. And I’m trying to think; I think I felt annoyed a few times yesterday about a few things, but I can’t remember. O_O Annoyed at my lack of remembering things. it’s so hard to get back into real life and routine! I have a bit of a temper, but it takes me a LOT to get to the point where I lose it and when I lose it, I lose it HUGE. I can always feel it burbling right below the surface. It always helps me to text my friend Lora when I am gritting my teeth. She usually makes me laugh and then I gain perspective and settle down. I find it definitely helps to text and speak to my friends when I feel like that. we always end up laughing which makes all the difference. It’s so hard to come back from a short vacation and shift immediately back into work mode. The weather has been annoying me this week. We had a couple beautiful sunny days and then it was back to rain and fog.